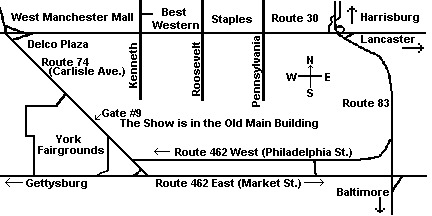 Map and Directions to the show. Traveling East or West on Route 30: Take the Route 74 Exit. Head South on Route 74 (Carlisle Ave.) The Fairgrounds will be on your right. Traveling North or South on Route 83: North- Take Exit 21B (Old Exit 9W) to Route 30 West. Take the Route 74 Exit. Head South on Route 74. The Fairgrounds will be on your right. South- Take Exit 22 (Old Exit 10.) Follow signs for Route 30 West. Travel Route 30 West and take the Route 74 Exit. Head South on Route 74. The Fairgrounds will be on your right. Traveling the Pennsylvania Turnpike: Take Exit 242 (Old Exit 18.) Head South towards York on Route 83. Take Exit 22 (Old Exit 10.) Follow signs for Route 30 West. Travel Route 30 West and take the Route 74 Exit. Head South on Route 74. The Fairgrounds will be on your right.